New website: www.thethreepeakschallenges.com - please visit it and see what you think! We are keen to create new links, so link to us and ask us to link back to you. Let us know what you think. Please visit our 'Latest News' webpage to see whats happening, and feel free to leave any comments about this event series. This also contains any last minute reduced price offers..! What is the Open Three Peaks Challenge Series? The Open Challenge Series 2013 is a series of National Three Peaks Challenges, Yorkshire Three Peaks, Mountain Challenges and Training Events, which are open to teams and groups from all sectors, with just a simple Entry Fee & absolutely no fundraising requirement for any charity or good cause. You are free of course, to raise funds for any charity or good cause if you wish. Our Team or Individual Entry Fee is all you need to pay. No fundraising commitments. No targets. The Open Challenge Series is unique in this respect, and was infact organised for the first time in 2001 due to the large demand of teams and groups wishing to take part in a larger, well organised and supported event, but wanting to raise funds for a charity or good cause of their own - rather than for a large national charity they had no particular interest in. 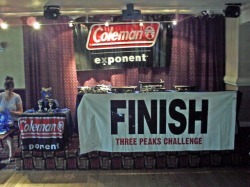 Are you organising your own Three Peaks Challenge event in 2013? Our Training Days at Wasdale will give you the chance to meet some very experienced Three Peaks mountain guides and organisers, get some top quality information, and also climb Scafell Pike - either during daylight or in the dark..! Charity or private event. Smaller groups of four walkers may want to enjoy a social weekend in Yorkshire whilst attempting our Yorkshire Three Peaks Challenge of Pen-Y-Ghent, Whernside & Ingleborough within 12 hours. That's some 24 miles of walking and summiting the highest local peaks. Only £100 per team, or £180 for a team of up to 6 walkers with a professional mountain guide included..! What do we need to enter an Open Challenge event? For the Yorkshire Three Peaks Challenge you will need to find a team of four walkers, supply your own walking equipment to the standard as required in our 'Kit List', bring a OS or Harvey Yorkshire Dales map, and supply your own food for the day. We recommend that you organise overnight accommodation locally before and after the challenge. Full details are available on the 'Yorkshire Three Peaks' webpage. Full details for each event on the challenge webpages. What is supplied to teams on an Open Challenge Series event? For all of our events we supply qualified and experienced mountain staff at various safety locations with licenced VHF radio communications to ensure team members have full safety support in place. We also have experienced first aid and safety ground staff at various other checkpoint locations to help walkers where required. We supply suitable start and finish venues, registration and start areas, basic mapping and route instructions, printed event information, Sport Ident timing equipment, team adventure bibs and numbers, etc. For Yorkshire Three Peaks events we also supply a number of basic refreshment points, and retirement points with return transport back to the event base at Horton-In-Ribblesdale. We also offer bunkhouse accommodation and basic camping facilities at the event base. Each finisher will receive a medal of achievement upon completion. For National Three Peaks events we supply indoor conference facilities for pre-event safety briefings, loan of VHF radios, emergency group shelters, lightweight cooker and fuel. Bespoke laminated map/guide set licenced by Harvey Maps, Sport Ident timing system with printout at the finish, pre-paid parking areas, medals, certificates and cold buffet at the finish. Please see individual event webpages for full details. Who organises the Open Challenge Series? The Open Challenge Series is organised by Merseyventure. We are a dynamic outdoor adventure company that have been organising corporate, private, and charity challenges and events since 2000. We are full members of the Institute for Outdoor Learning, and previous events and clients are listed on our website above. With our fresh approach to outdoor challenges, all of our mountain staff, ground support staff and helpers are chosen for their helpful and enthusiastic attitude, and great sense of humour in testing outdoor conditions. Raise funds for your own club or round table, charity or other good cause by taking part in the National Three Peaks Challenge. Climb the 3 Peaks of some of the highest peaks in the UK - Ben Nevis, Scafell Pike and Snowdon. Our Open Challenge Series don't require any charity fundraising comittment - but many groups choose to raise money anyhow. For more details about the Three Peaks Challenge, click the link or continue browsing through this website. Larger groups may be interested in our Corporate Team Challenge, where 6-8 walkers will attempt to scale each of the highest peaks in Scotland, England and Wales, within 24 hours. We also offer bespoke events and 3 peak challenges for small groups, and offer a mountain guide and minibus transport / transfer service. Email us for more details..! What is the UK 3 Peak Challange? The Three Peaks 24 hour Challenge is a mountain challenge, often charity based, in which teams try to climb some of the highest mountains in the UK, and travel between them using minibuses or other transport, hopefully in less than 24 hours from Ben Nevis to Snowdon. The 3 Peak involved are Ben Nevis, Scotland, - Scafell Pike from Wasdale or Seathwaite, England - and Snowden, Wales. Can you peak 3 times in 24 hours? Yorkshire Three Peaks a similar walking challenge often used as national Three Peaks training, visiting Pen-Y-Ghent, Whernside amd Ingleborough. Please click for Yorkshire Three Peaks route details. Interested in the Three Peaks Challenge record, or the Yorkshire Three Peaks record time? You won't find accurate information on Wikipedia, but click the links for Three Peaks History information. 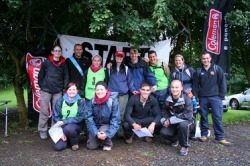 New Three Peaks Challenge information 2011 website.